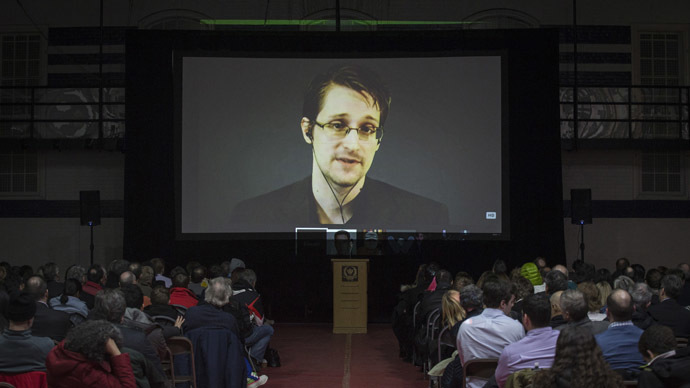 NSA whistleblower Edward Snowden appeared via video link from Moscow at the CeBIT IT trade conference in Hanover, Germany. He warned IT specialists they are the target of government surveillance. “They are looking for the people who are in this room right now. You are their target, not because you’re a terrorist, but because you have access to systems. You have access to the private records of people’s private lives and these are the things they want,” he warned. Since leaking documents revealing the size and scope of the NSA and US allies’ worldwide spying program, Snowden has been living in Moscow, Russia. He is a wanted man in his native America. But the IT expert turned whistleblower, who was once contracted to the NSA, maintained that he wanted to return home to the US and face the courts. “I want to tell the jury why I did it. I want to tell the court what these programs are. I want the jury to decide whether it was right or wrong that our rights and or Constitution were being violated in secret,” he told the audience. But he was also pessimistic about receiving a fair trial in the US. If convicted he would face up to 30 years in jail. Former army intelligence officer turned whistleblower Bradley Manning was sentenced to 35 years in prison for leaking documents about the conduct of the US military in Afghanistan and Iraq. "In the United States, under the current law right now, it's not even possible for me to enjoy a fair trial,” said Snowden. Snowden is popular in Germany, which has a more negative view of government surveillance because of its history under the Nazis and the East German Stasi secret police. Although German citizens may be against mass surveillance, there are few signs that much has changed in the corridors of Germany’s spy agencies post Snowden. It was reported in Zeit, a German weekly newspaper, earlier this year that the BND, Germany’s foreign intelligence agency, gathers 220 million pieces of metadata from phone calls and text messages each day. Zeit also revealed that BND agents are instructed to be as elusive as possible when being questioned by politicians from the Oversight Committee. “The countries such as Germany that have benefitted the most from the risks that he [Snowden] took are the same ones that have most shamefully turned their backs on him,” Glenn Greenwald told the conference. Snowden remained more upbeat and told the conference that next year he hoped to attend in person, but would make sure he asked Chancellor Merkel first. The US director of Citizen Four, the academy award winning documentary, which tells the story of Snowden’s revelations and how he went into exile has said she lives and works in Berlin because she believes her material would be taken by the US government if she moved home. Internet security was one of the biggest issues at CeBIT 2015 with many startups developing new security systems of their own. A study published recently by the international auditors KPMG showed that security awareness is becoming an increasingly high priority for German businesses. It also showed a huge jump in cybercrime up from 26 percent of businesses saying they were affected in 2013 to 40 percent in 2014. Financial services were the most common targets, but cybercriminals often target small and medium size companies as they have weaker security systems in place.